The Pepperell Historical Society will hold its May meeting at the Schoolhouse, 50 Shattuck Street, Pepperell, (corner of Harbor St.) on Monday, May 14, 2018, at 7:00 p.m. All are welcome! Please join us. For more information contact the Historical Society. Why did colonists disguise themselves as Mohawk Indians in 1773, board three ships in Boston Harbor, and destroy over 92,000 pounds of tea? Join us as Danielle Beaudette of The Cozy Tea Cart in Brookline, NH, discusses tea and the role it played in the American Revolution. This program is supported in part by a grant from the Pepperell Cultural Council, a local agency which is supported by the Mass Cultural Council, a state agency. The Pepperell Historical Society will hold its April meeting at the home of Claudette and Roland Gosselin, 48 West St., Pepperell, on Monday, April 9, 2018, at 7:00 p.m. All are welcome! The agenda will be posted as the meeting date approaches. For more information contact the Historical Society. 10:15am	Presentation: What is the DAR? 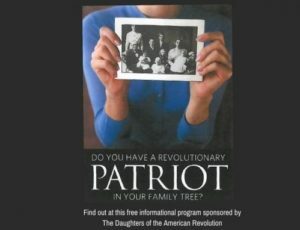 Learn about this service organization whose patriot ancestors made possible our American independence. Sign up for an appointment on Eventbrite. Bring in any useful data about your family such as birth, marriage, and death certificates, Bible records, land probate, will records, census records or obituaries.